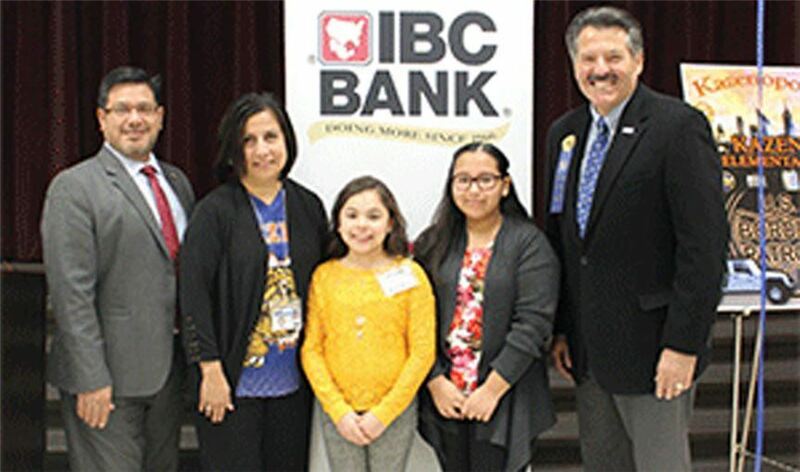 (NOV. 10, 2018) LAREDO, TX - On Friday, November 2, students at Abraham Kazen Elementary School celebrated the grand opening of the IBC Bank at Kazenopolis, a mini city that provides students an opportunity to see how a community operates by giving them a variety of real-world positions. Minitropolis® was created by IBC Bank in 1996 and currently operates in more than 30 elementary schools across Texas. "Minitropolis offers a multitude of social and financial learning opportunities to students in elementary schools across the state," explains IBC Bank-Laredo Executive Vice President Nativido Lozano, III. "Education and community engagement are extremely important to IBC Bank, and we are honored to partner with the teachers and faculty at Kazen Elementary to provide a fun and interactive environment for students to learn important life skills." Kazenopolis will continue through the rest of the school year. Students earn "salaries" by working in their respective roles throughout the "city." Fifth grade students serve as Kazenopolis' mayor and city council, fourth graders as IBC Bank executives and tellers, third graders as grocery store employees, second graders as the recycling department, first graders as the city's music program and kindergarteners as the treasury department. "IBC Bank's community efforts focus particularly on inspiring future generations to ‘do more'," said Lozano. "In addition to promoting financial literacy and good work ethic, the Minitropolis® program also encourages and rewards students for their scholastic performance, behavior, attendance and leadership." Laredo Mayor Pete Saenz was in attendance at the grand opening. A total of 21 students participated in the bank's ribbon cutting event, and will work as IBC Bank "employees" in Kazenopolis. The students were chosen after touring IBC Bank where they received on-the-job training, worked alongside tellers and had the opportunity to meet several bank officers to learn first-hand about how banks function. IBC Bank-Laredo is a member of International Bancshares Corporation (NASDAQ: IBOC), a $12.0 billion multi-bank financial holding company headquartered in Laredo, Texas, with 191 facilities and more than 289 ATMs serving 90 communities in Texas and Oklahoma. In 2016, IBC celebrated its 50th anniversary since opening its doors for business in 1966. IBC Bank's slogan "We Do More" reflects the bank's dedication to the growth and success of both the customers and the communities it serves. International Bancshares was ranked 19th on Forbes' prestigious list of 100 Best Banks in America in 2018. IBC Bank-Laredo serves the community with a retail branch network of 20 locations. IBC Bank-Laredo was selected as "Best Bank" in 2018 by Laredo Morning Times Readers. MEMBER FDIC / INTERNATIONAL BANCSHARES CORPORATION. Follow our Facebook page, @IBCBankWeDoMore. More information is available at ibc.com.